There was nothing much to do on our Saturday afternoon. We received a message from my mother is currently battling with cancer that the priest will come to our house for a mass. My wife didn't take it well and told me she doesn'​t know what to react. Good thing her friend reassured her that priests usually visit sick people in their houses. Her worries subsides after that. My son loves playing and I am his favorite playmate. aWhile we were waiting for my wife's dish to finish, this little one gave me his 2 cute cars and signs to put it in the race track. He does this. Almost everyday. Haha!! He doesn't want to paly alone. Everyone must engage in his playtime, so we do. 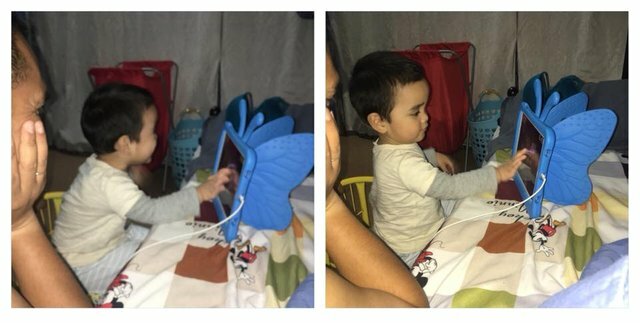 Once he was done with his toy tracks, he went to his iPad ​to watch his favorite Blippi. Now I just sent him to his Aunt while me and my wife go to our respective works. If only my salary is enough, I will tell my wife to stop working.